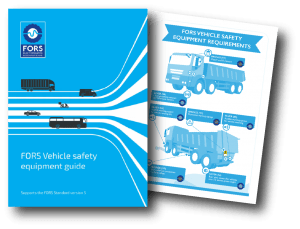 FORS has published an updated version of the vehicle safety equipment guide to help operators meet the vehicle safety equipment requirements of the FORS Standard version 5 – which will be effective as of 14 January 2019. The guide provides guidance on each requirement including the equipment that can be used, advice on the specification that this equipment should meet and who can provide this equipment. In addition, it includes a clear and helpful pictorial representation of what vehicle safety equipment is mandatory for each requirement and where the equipment needs to be installed on a right hand drive vehicle. The guide also contains a list of FORS Associates that market the safety equipment, including mirrors, side under-run protection, audible warning systems, proximity sensors and reversing cameras, with discounts for FORS members. The new guide is produced with the full support of FITAS – the Federation of Communication Services Installer Training and Accreditation Scheme.